iPhone 5: Apple's latest and the best smartphone in the world. Samsung Galaxy S3 is sold best in the world and has taken the top position on smartphone market sales for a long time. BlackBerry Z10 is BlackBerry 's latest smartphone with its latest oeSystem - BlackBerry 10. BlackBerry (nee Research in Motion) has loaded its flagship phone with great hardware. It has a speedy 1.5 GHz dual-core processor, 2GB RAM, and a screen with a higher pixel density than that of the newest iPhone. Call quality and reception is still excellent. The mobile world has all but acknowledged that BlackBerry 10 is the "make or break" moment for BlackBerry(formerly "Research in Motion"). Will the BlackBerry Z10 have what it takes to steal back some of the market share that was once rightfully BlackBerry’s? While iOS and Android have been building on their software for five or six years, BlackBerry was forced to build features from scratch to satisfy what has become the baseline expectation among smartphone users. BlackBerry Z10's screen offers a high definition, pixel-dense experience that puts it on par if not above the competition. It’s processor and RAM indicate it will be able to keep up with the computing power of its competition. Obviously the most interesting difference on the chart, though, is the OS. Seeing how BlackBerry 10 stacks up against iOS and Android will come down to actually experiencing it, but what we know looks promising. 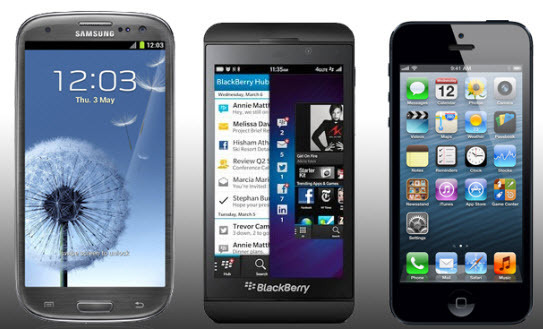 Can the Z10 hang with the iPhone 5 or the Galaxy S III? If you look at the specs below, it certainly seems it can. Besides, the three phones have different loyalty users. It is believed that Z10 would have a good sales still with users of business segment. 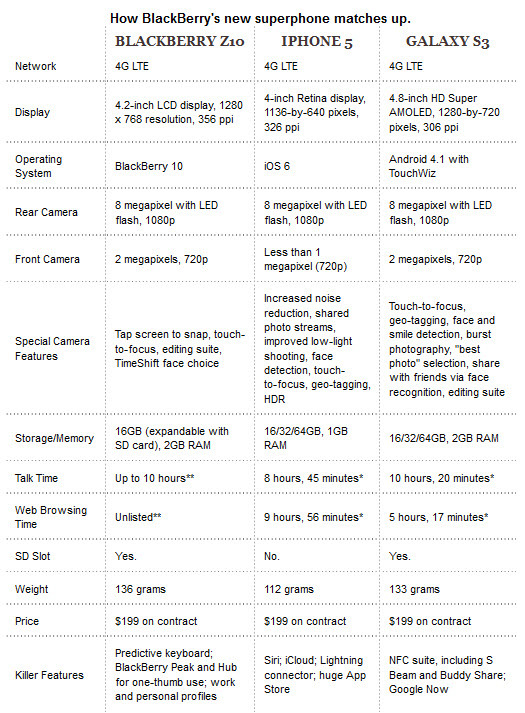 Compared specs of the two hottest-selling smartphones out currently to BlackBerry's new offering. The company says the phone will be available on all four major U.S. carriers.